The joint KAIST research team of Professor Byeong-Soo Bae of the Department of Materials Science and Engineering and Professor Doh Chang Lee of the Department of Chemical and Biomolecular Engineering was able to fabricate a siloxane-encapsulated quantum dot film, which exhibits stable emission intensity over one month even at high temperatures and humidity. 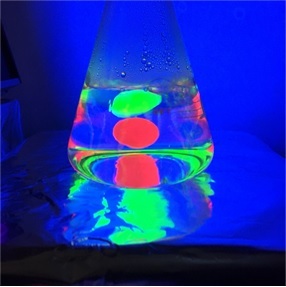 Quantum dots (QDs), light-emitting diodes (LEDs) for next-generation displays, are tiny particles or nanocrystals of semiconducting materials. Their emission wavelength can easily be adjusted by changing their sizes, which are just a few nanometers. A wide spectrum of their colors can also achieve ultra-high definition displays. Due to these characteristics, QDs are coated on a film as a polymer resin in dispersed form, or they are spread on an LED light source. They are thus considered to be crucial for next generation displays. Despite their exceptional optical properties, however, QDs are easily oxidized in a high temperature and high humidity environment, and, as a result, this greatly deteriorates their luminescence quality (quantum efficiency). Therefore, they are encapsulated in an extra thin layer to block oxygen and moisture. QD displays in the current market have a film inserted to separate them from LEDs, which create heat. The high unit cost of this protective layer, however, increases the overall cost of displays, lowering their price competitiveness in the market. For a solution, the research team applied the sol-gel condensation reaction of silane precursors with QDs. This technology uses the reactions of chemical substances to synthesize ceramics or glass at a low temperature. The team applied QDs in a heat resistant siloxane polymer by employing this technology. The siloxane resin acted as a cup holding the QDs and also blocked heat and moisture. Thus, their performance can be maintained without an extra protective film. QDs are evenly dispersed into the resin from a chemical process to fabricate a QD embedded film and retained the high quality luminescence not only at a high temperature of 85°C and in a high humidity of 85%, but also in a high acid and high base environment. Remarkably though, the luminescence actually increased in the high humidity environment. If this technology is used, the overall price of displays will decrease by producing a stable QD film without an extra protective barrier. In the future, the QD film can be directly applied to a blue LED light source. As a result, it will be possible to develop a QD display that can reduce the amount of QDs needed and improve its performance. The research team is currently applying for related patents both in and out of the country. The team is also plan﻿ning to transfer the patents to Sol Ip Technology Inc., a company founded at KAIST, to start the commercialization. So-gel condensation reaction in silane precursors between Methacryloxypropyltrimethoxysilane (MPTS) and diphenylsilanediol (DPSD). The inset shows photographs of a QD-oligosiloxane resin under room light (left) and a UV lamp (λ = 365 nm) (right). Free radical addition reactions among carbon double bonds of methacryl functional groups and oleic acids. The inset shows photographs of a QD-silox film under room light (left) and a UV lamp (λ = 365 nm) (right).